Beth Iskiw’s collection of provincial championship jackets is already an impressive one, with four provincial junior titles to her credit as well as two provincial Scotties women’s championships. Trouble is, they’re all from Nova Scotia, where she grew up. Now that she’s living in Edmonton, Iskiw wants to add a few Alberta blue-and-yellow outfits to those navy blue Nova Scotia jackets. And based on the performance of Iskiw and her team — rounded out by skip Heather Nedohin, second Jessica Mair and lead Laine Peters — there’s a solid chance she could do just that this season as the Nedohin squad is making a spirited run at ending the recent dominance of Calgary teams in Alberta. 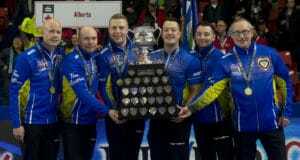 That team came close last season, losing the provincial final to Shannon Kleibrink, but the squad’s 2010-11 performance was good enough to qualify for the 2011 Capital One Canada Cup of Curling in Cranbrook, B.C. Iskiw (then Roach) played vice-skip for four straight Nova Scotia junior women’s championship teams skipped by Meredith Doyle, from 1996 through 1999. The Bluenosers lost the 1996 semifinal in Edmonton to Saskatchewan’s Cindy Street, who went on to lose to none other than Nedohin (then Godberson) in the Canadian final. A year later in Selkirk, Man., Iskiw was able to celebrate a Canadian championship, beating Quebec’s Marie-France Larouche in the gold-medal game, then went on to win the bronze medal at the world junior championships in Karuizawa, Japan — the test event for the 1998 Winter Olympics. 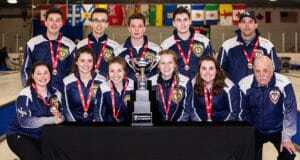 In 1998 at Calgary, Nova Scotia missed the playoffs despite a solid 8-4 round-robin record, and in her final crack at the juniors before aging out, in 1999 at Kelowna, B.C., Iskiw helped Nova Scotia finish first in the round-robin, but the team went on to fall to Larouche in the final. Since then, Iskiw teamed with Doyle to win the Nova Scotia women’s title in 2002 (finishing with a 5-6 record at Brandon, Man.) and 2004 (6-5 at Red Deer, Alta.) before she moved to Edmonton and, eventually, hooked up with Nedohin. 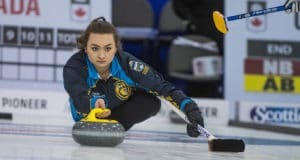 She’s attended two Scotties with Team Alberta as an alternate, but now her heart is set on winning the provincial title as a player. Next: Capital One Rocks & Rings: Not just your school game!